Google Analytics by default captures data just as it appears in a visitors browser. This being so, you can have two or more URLs that are the same but appear as separate entries due to different cases in the URLs, both lowercase and uppercase. Although both will take you to the same page if you were to put them into your browser, Google Analytics will create separate line entries for each one leaving you to have to merge the two to get to the complete data for that URL. Imagine the pain if you had 100s, 1000s or more pages on your website with multiple line entries for the same URL. 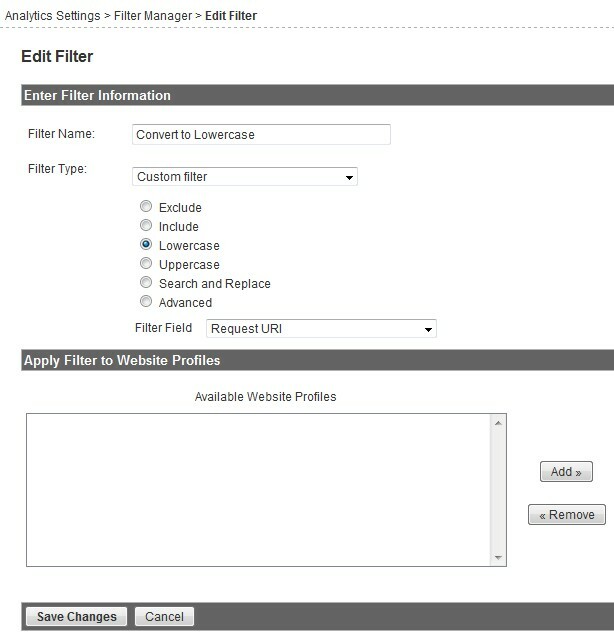 However, Google Analytics allows you to apply a Custom Filter to remedy this problem. You can associate this filter on a profile by profile basis in case you have certain profiles that you do not want this applied to. One thing worth noting is that this won’t “fix” past data already in your reports, but anything going forward it will put into one line entry (either lowercase or uppercase depending on how you setup the Custom Filter. But, i have a question, now that i already did the URI Filter… how can i merge my previous /LowerCase/UperCase/Pages to merge the collected data (traffic, visits, bounces, etc) to my lowercase ones ?